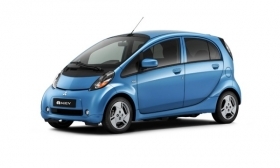 Mitsubishi's i-MiEV will be called the i in the United States. Mitsubishi Motors North America will require dealers to invest in in-store signs and special personnel to sell the brand's i electric vehicle, slated to go on sale later this year. Dealers will have to employ a salesperson specifically trained to sell the i, known in Japan as the i-MiEV, and a master technician specifically trained on the electric vehicle, said Marvin Baisden, Mitsubishi's director of franchise development. Dealers also will have to buy hanging showroom signs for the i, he said. The total cost of the upgrades will be a little less than $30,000, Baisden said. Mitsubishi looked at the facility improvements made by Hyundai dealers to sell its Equus flagship luxury sedan, Baisden said. Hyundai dealers had to install specific signs and displays and dedicate a corner of their showrooms to get the Equus. He said the improvements for the i will be a little more modest. "We're not going to get that elaborate," he said. "We're trying to be conscientious of costs and considerate of what's going on in the marketplace." A Mitsubishi dealer training and education campaign is under way ahead of the electric vehicle's launch in November. Initially it will go on sale at 42 dealerships in Oregon, Washington, California and Hawaii. The vehicle is expected to be sold nationally in the first quarter of 2012.